We all have stereotypes, images or sensations of a place based on what you know about it. In part, that’s what makes this project so fun – discovering whether the spicy flavors I expect to find in various parts of the globe match up to my own expectations. That’s why I was excited to start this project with a food from Afghanistan, a country that, from afar, reminds me so much of my home state of Nevăda – dry, cold, mountainous and generally reserved for hearty souls. Of course, Nevăda kind of lacks anything resembling a cultural touchstone of a meal. 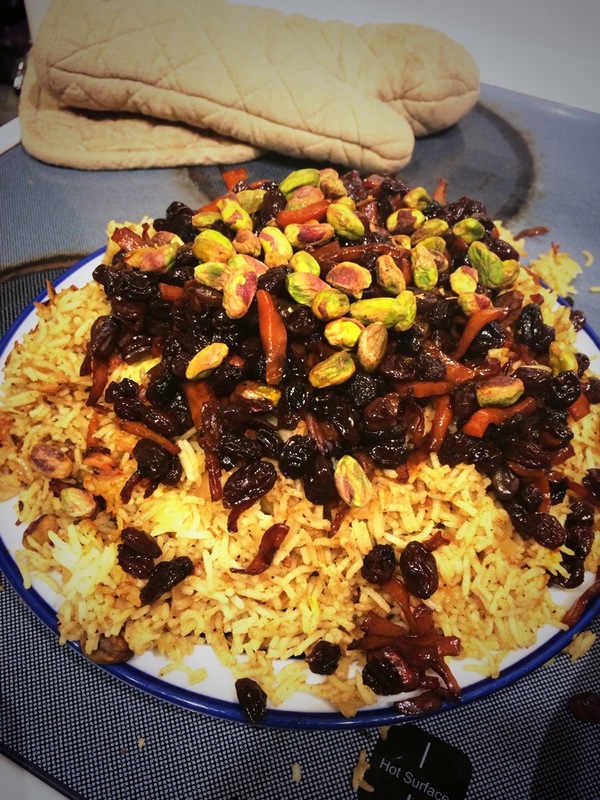 The adventure of the national dish of Afghanistan was, to a degree, searching for the soul of cold desert cooking. In Qabuli Palao, I was not disappointed. This was much more than a basic rice pilaf – it was a great, complex, nuanced combination of flavors that made for a great, and relatively simple Friday night meal. This recipe was adapted from several sources, particularly the recipe at AfghanCooking.net. Mix the marinade ingredients in a large Ziploc bag. Adjust spices to taste. Dice chicken (or lamb) and marinade for at least one hour. Remove chicken from bag and rinse. 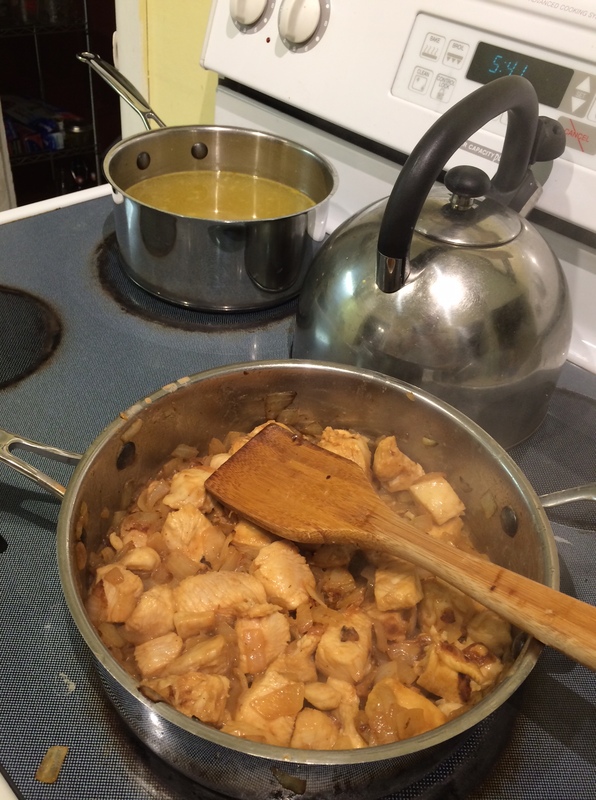 Soak the saffron into the chicken broth (back) while sautéing the chicken and onions. Choose a sauté pan that is at least a couple inches deep and large enough to fit all the chicken. 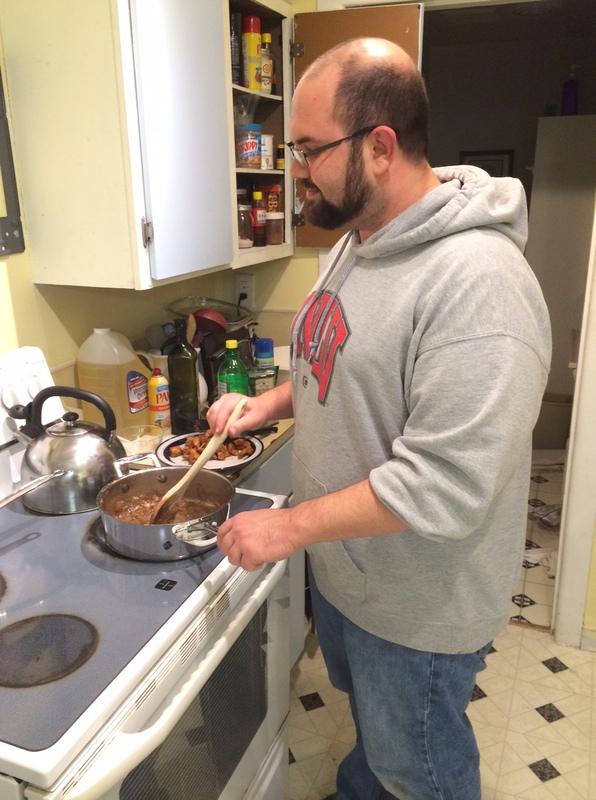 Pour 1/4 cup of the oil in the pan and sauté the onions over high heat, stirring quickly, until brown (5-10 minutes). Don’t burn them. Add the chicken to the pan and sprinkle with 1 ts of salt. Cook the chicken over medium-high heat for 6 minutes, turning from time to time so all sides turn golden brown. The onion will start to caramelize and turn into a thick sauce. Adding the spice to the onions after removing the chicken. Also, showing my UNLV pride. Add 1/4 cup of the chicken broth, and continue stirring to keep the chicken from burning. Once the liquid has been absorbed, add another 1/4 cup of, bring it to a boil, cover and simmer for 10 minutes. The sauce should turn a dark brown. If your sauce does not take on a dark color you can add the Kitchen Bouquet to give it color. Add remaining chicken broth to a medium-sized pot and heat to a simmer. Add garam masala and saffron, and leave at a simmer. In a large frying pan add 3/4 cups of water and bring to a boil, add the carrots and cook until tender and deep orange, 5 to 7 minutes. Once the carrots are done, drain the pan of liquid. Add about 2 Tb of oil, raisins, pistachios and sugar to the carrots. Stir over medium-high heat and keep stirring for about 3 minutes. Remove from heat and package the carrots into an aluminum foil pouch. Bring the saffron chicken broth to a boil, add the rice to the pot and boil until it is al dente. Don’t overcook it. Place the chicken bits on top of the rice in your casserole dish, then add the pouch of carrots on top of that. Immediately strain the rice through a colander. Pour into casserole dish, add the gravy and mix well. Arrange the meat on top of the rice. Set the aluminum pouch of carrots on top of the rice. Bake all for 15 minutes in 500º then drop the temperature down to 250º. Cook for another 20 minutes. Remove the chicken and put it on a large platter, in a pile. Cover with rice. Sprinkle the carrot mixture on top, and add some fresh pistachios for garnish. 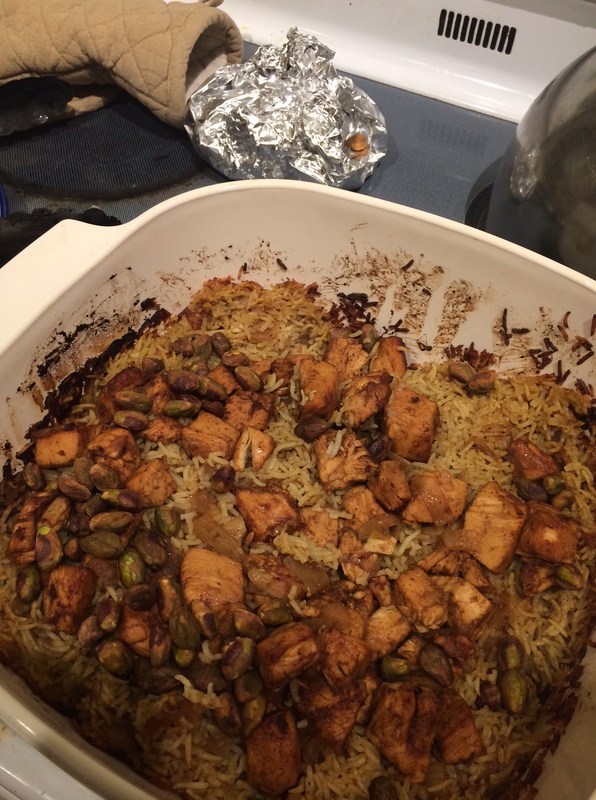 Finished Qabili Palao, on a dish that’s a little too small for this serving size, garnished with fresh pistachios. This ended a little dry, so I might have added a bit more liquid to it. I also might have upped the spices, but will try that next time. All in all, an enjoyable start to the adventure! And certainly more to my American taste buds than the next journey – sea snails from The Bahamas.